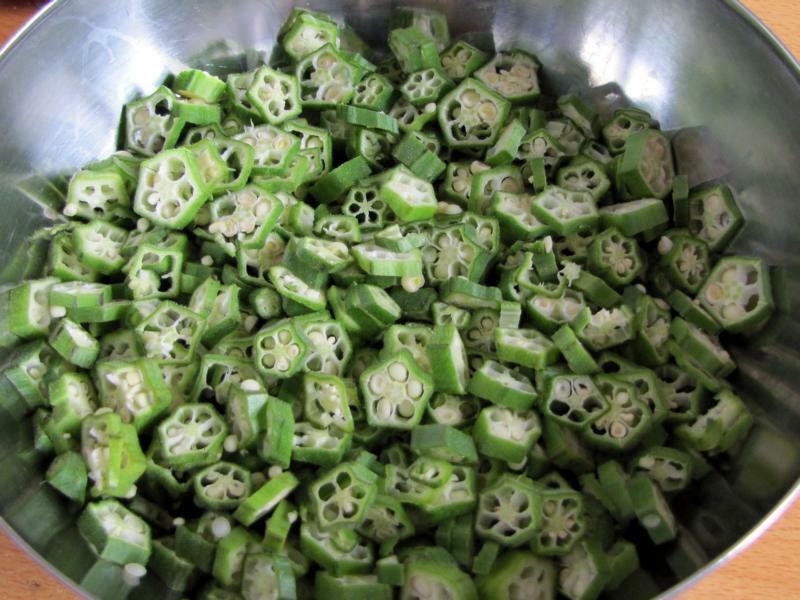 Okras are extremely common in most Middle Eastern and Far Eastern regions. They are a popular part of Indian cuisine. 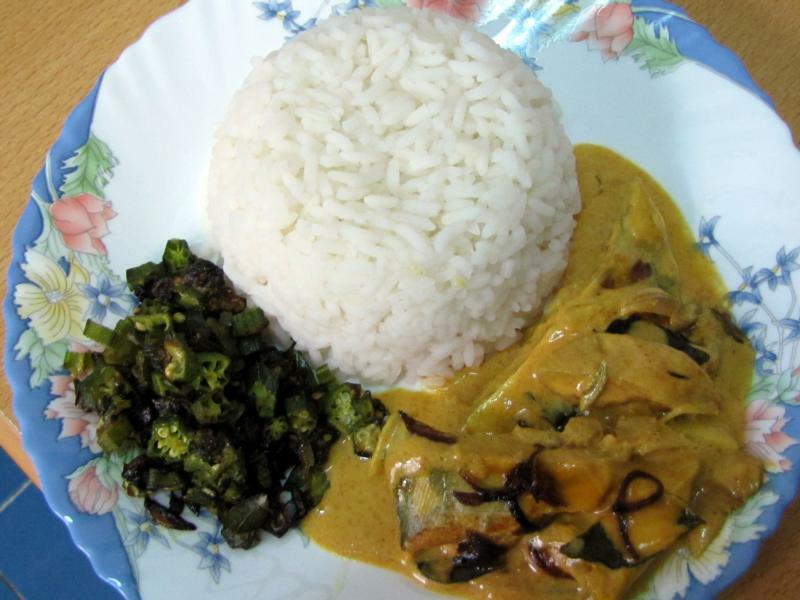 Unlike western and Middle Eastern countries, where okras are typically cooked along-with meat; in India they mostly constitute a vegetarian meal. 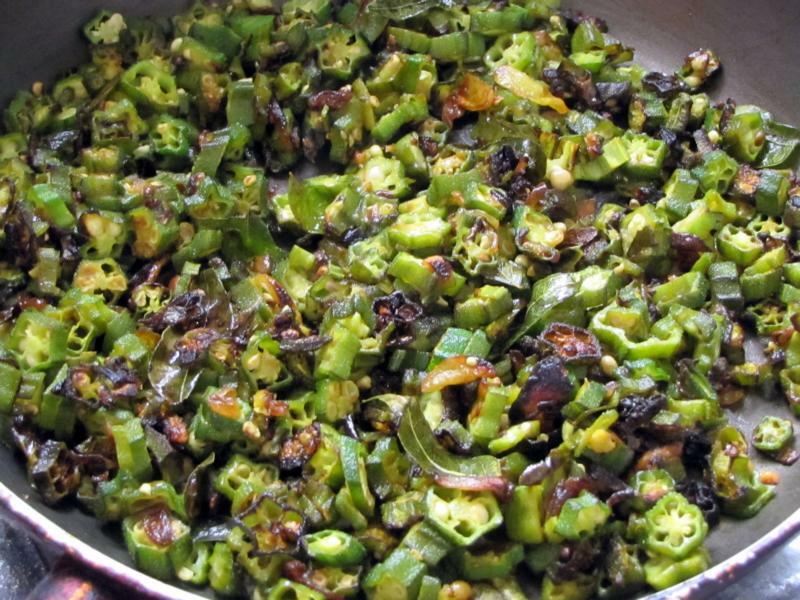 Whether stir-fried, cooked in spicy gravy, or used in raita, Okras are extremely diverse and it is entirely unto your imagination how you choose to use them. 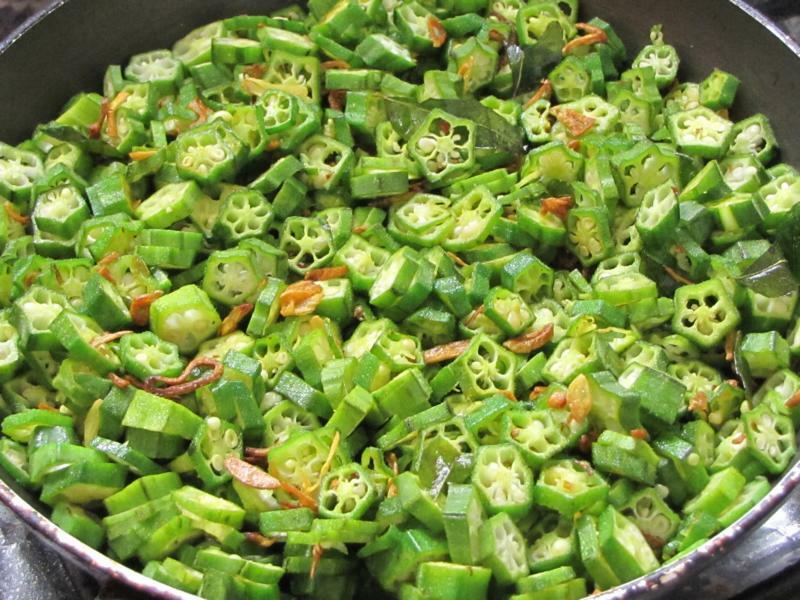 Typically as in any Keralite household, at my place also Okra or Lady’s Fingers are consumed in different forms all round the year. Since my daughter also loves them, this super healthy veggie – rich in protein, vitamin C and anti-oxidants, are a frequent addition to our meals. This fried Okra recipe is so simple you can breeze through it and be guaranteed of delicious result. A good Bhindi sabzi begins with selecting good fresh Bhindis. Unless you are absolutely sure that the grocer stocks the best quality, which is not very likely, I would suggest take some time for this process since the rest is relatively simple. Check for firmness. Test by holding a Bhindi in your fist upside down and try to snap off the tail using your thumb. If it breaks with a firm snap, toss it in your basket, if it doesn’t, chuck it and move to the next. Once you have your bunch, wash them well and dry it well or gently wipe with kitchen towel. Trim the ends and chop the rest into thin round pieces. 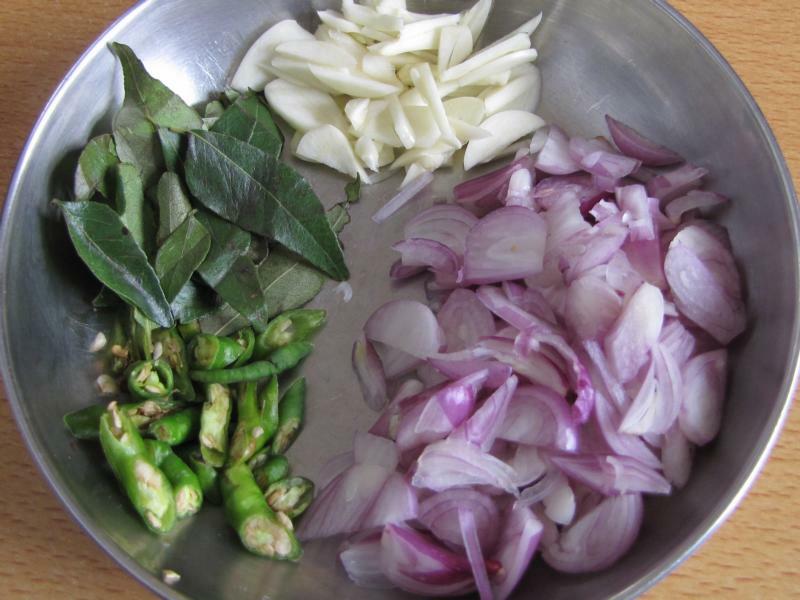 Basic ingredients including shallots, curry leaves, turmeric powder, green chilies and garlic. 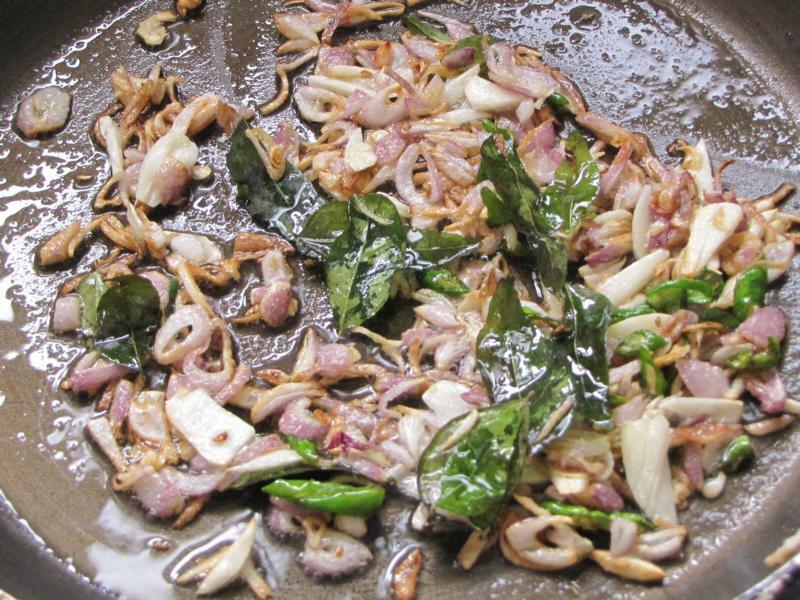 Fry the onions in coconut or vegetable oil for 2 minutes followed by garlic, green chili, and curry leaves. When the onions are about to turn golden brown add 1/2 tsp of turmeric powder and salt to taste. Fry for half a minute and then add the okra. ‘Lower the flame and let it cook in open pan on low flame for around 10-15 minutes till the okra becomes a bit crisp. 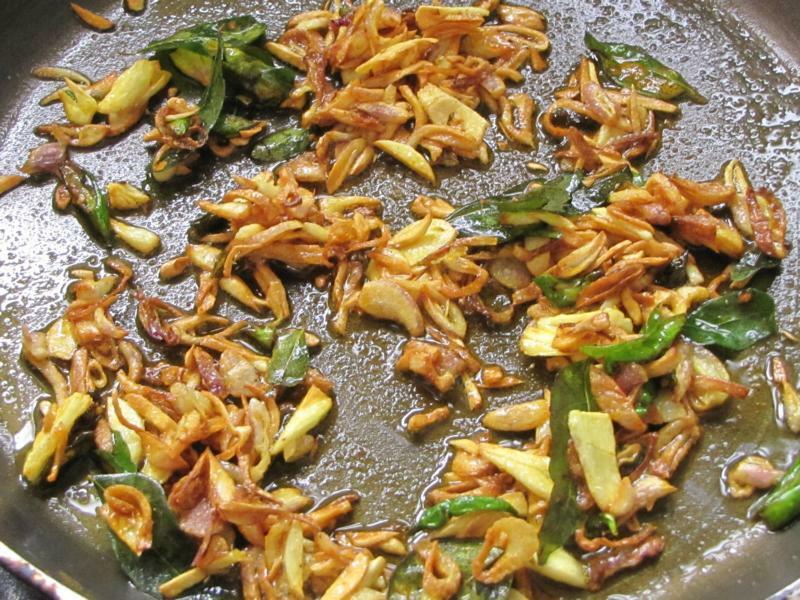 This dish goes well with rice and dal or sambar or fish curry. Heat a pan, pour some oil and add the chopped onions. Fry for around 2 minutes. Add the garlic, green chili and curry leaves. Sauté for around 2 minutes till the onions start to turn golden brown. Add the turmeric powder and salt to taste. Fry for half a minute and then add the okra. Lower the flame and let it cook on low flame for around 10-15 minutes till the okra becomes a bit crisp. Stir occasionally. Serve with steamed rice along with dal, sambar or fish curry. Another Okra recipe for my collection, thanks for sharing!!! I have bookmarked. Wish you a wonderful weekend. Thanks Liz. Do let me know how it was if you try it. Have a great weekend yourself.